Purple altar hangings and priestly vestments proclaim the sovereignty of Christ crucified and raised. Purple, by reason of its rarity and costliness was associated exclusively in the ancient world with sovereigns and emperors. We Christians have only one king, Jesus, the Lamb among wolves. Falling towards the bottom of the colour chart, purple also effects both worship environment and human emotions. It is a still colour helping us move into silence and attentiveness to God. We come in out of the Perth sun into the shade. On the Last Sunday before Lent we empty the water from the font and it remains empty for the whole of Lent. We don’t baptize in the weeks of Lent. The font is dry for forty days and forty nights. These are our wilderness days, times of looking within, examining our lives, coming into God’s presence with all our questions and frailties. In this time we grow, we change, we experience God’s never failing grace in our lives and we come to Easter and celebrate new life, life which comes out of death, life that comes out of darkness and stillness. The empty font reminds us of these things. At 6am and 9.30am on Easter morning we all renew our baptismal vows. It is a great time of year for baptisms of both adults and children. Easter is baptism! The Paschal Candle is our principal sign of the crucified and living Christ in our midst, burning in our midst from Easter to Pentecost, and at every baptism and funeral through the Christian year. It is taken away in Lent and we bless a new 2010 Easter Candle on Easter day. “All may, none must, some should” is the very Anglican approach to sacramental confession. If you would like to make your confession in Lent, please speak with Mother Christine. In Lent we traditionally pray, study, fast and give. This is a valuable way to return to the Lord. We come to the Eucharist and we give ourselves to silence, the prayer of listening. We study to come closer, move deeper into our faith. We give something up and then we can give the cash we have saved to acts of generosity and care for our sisters and brothers. We support the work of the Australian Board of Mission by giving each Sunday of Lent using Lent envelopes or purses available at church. 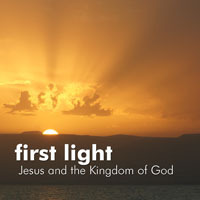 First Light – Jesus and the Kingdom of God is a Living the Questions study. We ‘ve used this series in the parish before offering Living the Questions and Eclispsing Empire and people have come back for more! This year we’re offering as many groups as we can so that everyone has the chance of joining one. Morning sessions start at 10am and end with a simple shared lunch at noon. Advent begins a new liturgical year. The four weeks of Advent is a time of preparation and anticipation of the coming of Christ celebrated at Christmas. We use the colour blue rather than the purple of Lent. This is an old tradition which has found a new home in Australian churches. In the northern hemisphere the days grow shorter and colder and people look forward to the light that will shine in the darkness at Christmas time. In Australia, and especially here in Perth, we are in the midst of summer. The skies are brilliant blue, the sea is aquamarine and through hot days and balmy evenings we look forward to the celebration of the birth of Christ. Blue reflects the mood of Advent here much better than the deep darkness of purple. It also distinguishes for us the different mood of Lent and Advent. Advent means ‘coming’. In this season we remember the One who came two thousand years ago in Bethlehem, the One who comes every day of our lives, and the One who will come again at the end of time. May Christ be born afresh in us this Christmastime. Maranatha – what does it mean? Marana tha. The grace of the Lord Jesus be with you. The one who testifies to these things says, “Surely I am coming soon.” Amen. Come Lord Jesus! The word which we use in our Advent intercessions, maranatha, is an Aramaic word. Aramaic is the language which Jesus spoke. This word has been preserved in Paul’s letter to the church in Corinth in the original aramaic, much like the word abba for Father is preserved in the texts. Paul’s ends his letter ‘Marana tha’ (marana qa) meaning ‘Our Lord, come’ or ‘O Lord, come’. It might also be translated as ‘Our Lord has come’ – Maran atha. The fact that the aramaic word is preserved probably means that this word was one of the earliest Christian prayers. It seems to have been used as a greeting by early Christians. In the last book of the New Testament, the book called Revelation, the word appears in Greek translation. ‘Come Lord Jesus’. We use this word in our Advent prayers. It expresses a longing for the presence of Jesus and the coming of the kingdom. We pray it with all those people before us who have longed for God’s kingdom of justice, peace and love. This prayer leads us forward into Christmastime when we celebrate God with us, Emmanuel. On either side of the altar during Advent their are icons, one of the Annunciation and one of the Nativity. These icons will help to focus our prayer and reflection during Advent and Christmas. 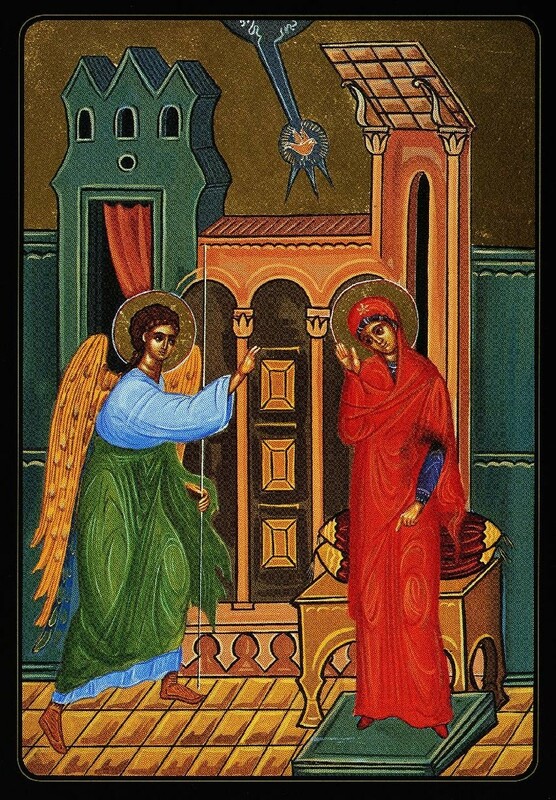 The icon of the Annunciation comes from the gospel of Luke. It is the story of the angel Gabriel appearing to Mary. Mary makes the faith response, “Here am I the servant of the Lord. Be it unto me according to your word.” The Spirit of God is represented coming down in the form of a dove from above. Mary is the first among the faithful, the first to welcome the living Lord into her life. All of us are Mary. All of us are called to say ‘yes’, to give Jesus a place at the heart of our lives, to carry him within us, to present him to the world. The icon of the Nativity or birth of Jesus shows Mary at the centre. Mary is the human being who gives birth to God among us, to the Word made flesh. The icon represents the Christmas story from both the gospel of Luke and the gospel of Matthew. The animals and the manger and the angels and the shepherds are from Luke. The magi following the star are from Matthew. The manger is an animals’ feeding trough and is coffin shaped reminding us that the shadow of the cross falls across both the birth narratives. Swaddling clothes mentioned by Luke are also the bindings of the grave. The darkness of the cave is the darkness of the world. In the foreground are midwives bathing the human child and Joseph with his back turned to the whole scene. This represents the fact that God is the father of the child Jesus and Joseph his adopted father. This is a way of saying Jesus is both human and divine. The Spirit descends in a shaft with the star on it. The circle at the top representing God. The nativity is the place where the human and divine meet on earth with us. God is with us and for us. Advent is the season that gives us time to savour the God who comes. The icons have been placed where they are accessible so we can spend some time looking at them. Advent is the time when the scriptures call us to attend, to watch, to pray and to wait.